When it comes to how the anime industry works, I’m always eager to learn more. Over the years I’ve learned a lot about the industry from series like Shirobako and Bakuman, which tackle the subject in fun but realistic ways. 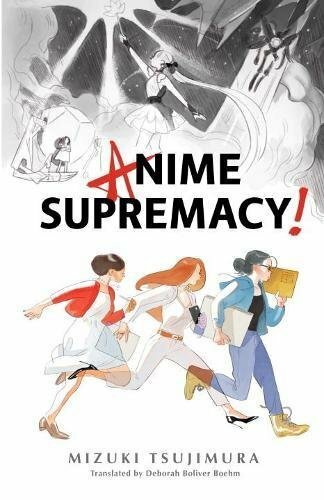 Now here to offer another fascinating look at the topic is the novel Anime Supremacy! from award winning Japanese author Mizuki Tsujimura – but does it live up to my high expectations? Anime Supremacy! tells the stories of three women working different roles in the anime industry: a producer, a director and an animator. Through the course of their stories we experience the challenges that crop up when creating an anime series as they aim for the title of ‘Supremacy’ – a term given to the very best anime that season, either in sales or from the buzz surrounding it. In such a stressful industry with tight deadlines, we’re offered a glimpse into what drives the characters’ passion. The book is composed of four chapters, one for each of the different cast members, and a short wrap-up. The characters’ tales all open the same way: with a monologue from the girl they’re focused on, explaining how they answer the question “Why did you get into the anime business?”. Their answers then feed back into the story, letting us see a snippet into their working days and where their passion comes from until we come full circle to a satisfying conclusion. In our first story we’re introduced to Producer Kayako Arishina, who fell in love with anime as a child. However, after working in the anime industry for a few years, her ‘critical thinking’ leaves her cold and unable to fall helplessly in love with anime as she once did – that is until the day she watches the latest work from a young genius director known as Chiharu Oji. Almost a decade ago he revolutionized the magical girl genre and captured Kayako’s imagination. Now nine years later Kayako is set to work with Oji on his latest work, but will the director be everything she hoped after idolizing him for so long? The second story follows Director Hitomi Saito, who comes from a poor family and never watched anime during childhood. She sets her sights on obtaining a government job until the day a college friend lends her a copy of the animated movie Butterfly. The movie strikes a chord with Hitomi and she then learns everything she can about anime and the industry, eventually working her way to the position of director. Now about to embark on a huge adventure in directing a children’s mecha series and competing with Chiharu Oji’s latest work, Hitomi has a lot to prove both to the industry and herself. Can she create something that resonates with people as much as Butterfly did with her? The author, Mizuki Tsujimura, has written a really outstanding book here. Not only is Anime Supremacy! a fascinating look at women working in the anime industry, it’s also filled with useful information about how the business works. It is worth keeping in mind that Tsujimura does not work in the anime industry, and as well researched as the book is (studios such as Production I.G, Toei Animation and Aniplex are listed in the acknowledgments) it’s very possible that not everything is true to life. Overall the book is incredibly well written, no doubt helped by Deborah Boliver Boehm’s excellent translation – which is problem-free. This is nice to see after the issues with the latest Monogatari releases from publisher Vertical. There are some illustrations dotted throughout the book for each chapter start but I can’t find who they’re drawn by. The back cover of the book credits Hwei Lim for the front cover illustration so I’m going to assume they are also responsible for the other images, which are all fairly low-key affairs but look nice enough. It’s worth noting that in Japan the book was illustrated by CLAMP, so the images on offer here are replacements. Anime Supremacy! was near impossible for me to put down day to day. The book sparks my own love for anime and reminds me why I fell in love with (and continue to be in love with) the medium. The only real drawback that prevents me giving it full marks is that someone less familiar with the anime industry and lacking knowledge in the fundamentals of how it works is not going to have as much fun reading it as I did. There are a number of exchanges between characters and situations that would prove difficult to follow if you don’t have a basic understanding of what’s going on and why. What I’d recommend is that you watch P.A Works’ Shirobako series first, and if you come away having enjoyed that then you’ll definitely get on with this book. With a huge collection of light novels to keep up with, I currently don’t read many full-length novels, but Anime Supremacy! has proven itself a must-read for an anime fan like myself. Well written, informative and charming – this is one of the best industry-focused novels to leave Japan recently. Without a doubt if you’re someone who cares about the workings of the anime industry then this book belongs in your collection. Masquerade and the Nameless Women offers everything I could want from a mystery novel. With a satisfying story, believable characters, and compelling twists and turns, this book is a real page-turner. From the creator of Nichijou comes more surreal comedy, featuring a student in debt, a really strong granny, and a woman worshipping a god she made yesterday.